Actually this is Thanksgiving, on Grenada, October 25. We did not to have our friends spend their holiday driving us around, so we elected to just chill out at the Gem. I ran down to the Spiceland IGA area, and found the sushi shop would be open at 6pm, and it appeared that the IGA was closed. I cut over to the Grand Anse beach to run back to Mourne Rouge. No pictures, as it started to rain a bit heavily during my run. After breakfast, I took to snorkelling. I was really having a blast with it. I saw a small school of fish-about ten or twelve inches long! And something that looked like a snake on the bottom! 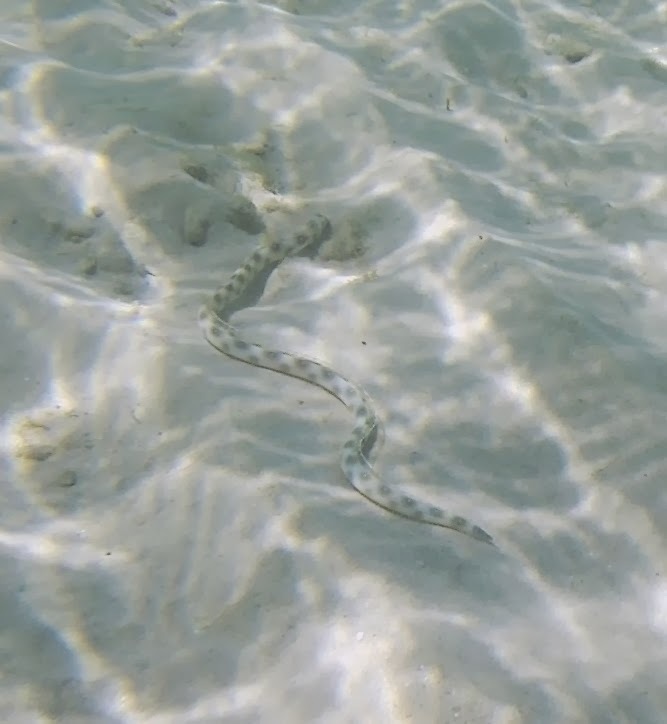 I don’t know whether it was an eel, or just a fish that resermbled a snake. I tried to take comfort in the fact that there are no poisonous critters on Grenada. Then I discovered I could use the Kalinago’s kayak! So I got out there and paddled around. Dennis came looking for me, as I had been out there on the beach for about 2.5 hours (oops.) I had no watch and NO PHONE with me, so I really didn’t have an idea of the time. I was just having a blast out there. I got a bit pink despite sunscreen! After lunch, I just chilled out on the balcony. I meant to go back out for a swim, but it kept on and off raining. I finally showered and gave up on the second swim for the day. Jude showed up to take Eddy over to the Med School for the Thanksgiving ceremony, but as our neighbors were going, Eddy hopped a ride with them. Jude ended up driving us over to Carib Sushi. My, that is some fine sushi! We picked up Jude’s friend Joann, and then just chilled out on the balcony for drinks for the rest of the evening. Only one more day left in Grenada! This entry was posted in Training on November 6, 2013 by Kim.